Renting live houses to organise gigs in Tokyo can be expensive. Therefore, a popular alternative for smaller gigs is to do a 'studio live', a casual kind of event held in a rehearsal studio room. Of course it is a bit cramped, but the sound is usually good and everyone can bring their own drinks. Events are regularly held at this very punk studio, usually in their larger room, but also in the smaller ones. They also have a rooftop area where you can drink and have barbecues. You basically pay the hourly rental price plus 900 yen for staff. They have a nice large room that you can use for gigs. It's basically 4000 yen per hour with a minimum of 5 hours. It is about a 10 to 15 minute walk from the station though. 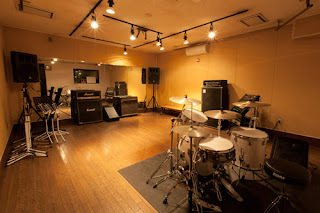 This rehearsal studio chain allows studio live events in some of their locations. You'll need to call them for details. Some of this chain's studios have rooms set up for gigs. They have live spaces called Attack (48) and Music Inn 50 respectively, although at about 7000 to 8000 yen an hour, it doesn't end up much cheaper than booking an actual live house. These spaces are more reasonable than the Shinjuku and Akihabara ones, at about 4000 to 5000 yen an hour. This place which is not far from Yoyogi station allows live events in one of its studios for around 3000 yen an hour. This studio at Nakano Sun Plaza has a large room for 4200 to 4500 yen an hour. 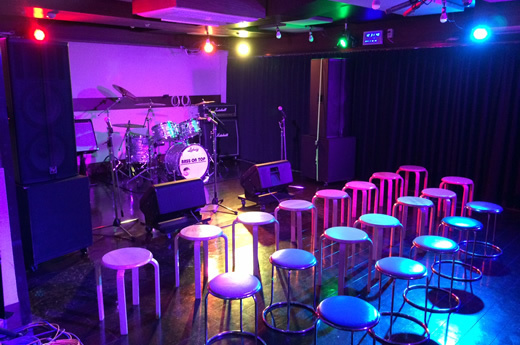 At 6000 yen an hour including 2 staff members to help with the PA, you can organise gigs here. This place has very reasonable prices (15000 to 19000 total) for mini live shows. This place seems to work somewhat like a live house.